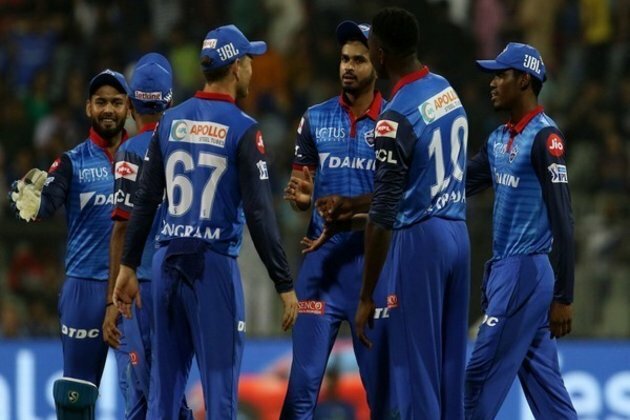 Mumbai (Maharashtra) [India], Mar 25 (ANI): Rishabh Pant's unbeaten knock of 78 runs and spirited performances by bowlers helped Delhi Capitals beat Mumbai Indians by 37 runs on Sunday at the Wankhede Stadium. The unbeaten knock of 78 by Pant saw the batsman recording the fastest fifty ever scored against Mumbai Indians in the history of Indian Premier League (IPL). In pursuit of 214, Mumbai Indians got off to a quickfire start as openers Quinton de Kock and Rohit Sharma started going after the bowling from the very start. Ishant Sharma was able to strike big for Delhi as he dismissed Sharma for 14 runs in the fourth over of the innings. Suryakumar Yadav (2) who came into bat at number three, was sent back into the dugout early as the batsman was run out by Delhi skipper Shreyas Iyer after deciding to take a suicidal run. Mumbai were pegged further back as de Kock (27) was sent packing by Ishant Sharma and Mumbai were reduced to 46 runs for the loss of three wickets after the first six overs. The team's hopes were relying on Kieron Pollard and Yuvraj Singh and these two did not disappoint as they both stitched together a partnership of 50 runs. But Keemo Paul came to Delhi's rescue as he picked up the scalp of Pollard (21), dismissing him in the 11thover. Capitals picked up the wicket of Hardik Pandya reasonably early dismissing him for a duck reducing Mumbai to 95 for five. Krunal Pandya, who came out to bat at number seven played a cameo of 32 runs off just 15 deliveries, but when Trent Boult dismissed him, Mumbai were facing an uphill task. With 80 required off the final five overs, Yuvraj gave it his best shot but he kept on losing partners at the other end and Delhi was finally able to win the match by 37 runs. Earlier, Mumbai Indians won the toss and they opted to bowl first. After being asked to bat first, Delhi Capitals got off to a poor start as they lost their opener Prithvi Shaw for just seven runs in the second over of the innings. Iyer (16), who came into bat at number three, was looking good in the middle, but Mitchell McClenaghan dismissed him too in the fourth over reducing the Delhi side to 29 for two. Colin Ingram, who came out to bat next, stitched together a partnership of 83 runs along with opener Shikhar Dhawan. Both the batsman mixed aggression with caution perfectly, allowing Capitals to stage a comeback in the match. Ben Cutting provided the much-needed breakthrough for Mumbai as he dismissed Ingram for 47 runs. Pant came out to bat next, and he made his intentions clear from the start, playing some audacious shots to take the team to an above-par score on the Wankhede wicket. Dhawan was finally dismissed for 43 runs in the 16thover by Hardik Pandya. McClenaghan was among the wickets again as he sent back Paul to the dugout for just three runs but Pant continued to pile on the misery on the Mumbai bowlers as he kept on scoring boundaries at regular intervals. Mumbai kept on taking wickets at regular intervals, but Pant's dominance allowed the Delhi Capitals to post 213 runs on the board for the loss of six wickets. Pant finished the innings with an unbeaten knock of 78 runs off just 27 deliveries and Delhi were able to score 99 runs in the final six overs. McClenaghan was the pick of the Mumbai Indians bowlers as he was to take three wickets. Delhi Capitals next take on Chennai Super Kings on Tuesday, March 26 whereas Mumbai Indians will play against Royal Challengers Bangalore on Thursday, March 28.